Laura Ashley bedding is well known for the delicate colors and country cottage hues. The Laura Ashley Eva Comforter Set is certainly no exception. 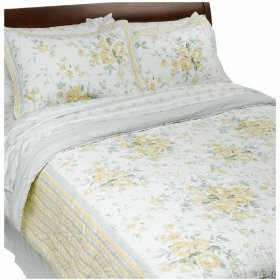 There are delicate yellow roses quilted on the face of the comforter with soft green leaves. The reverse of the comforter has a pale gingham pattern and both the comforter and the pillow shams have quilted coordinating borders. The comforter has mitered corners giving the set a tailored look. The comforter has 100% polyester fill and the set is made from 100% cotton and making it machine washable. This is one bedding set that you will love. Imagine keeping warm and cozy while also doing some good and charitable deeds. 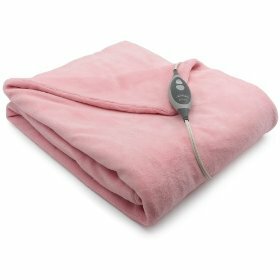 You can do that with one purchase – the Sunbeam SlumberRest Camelot Microplush Heated Throw in Breast Cancer Awareness pink. For each blanket that is sold, Sunbeam will donate $1 to the City of Hope, an organization that supports breast cancer awareness, research and treatment. They are willing to donate as much as $25,000 to the cause. When it comes to the blanket itself, this heated throw measures 50 by 60 inches and has a 6-foot cord so you can move about and find a place to be comfortable. Unlike some heated throws that only have an on or off setting, this throw gives you three heat setting options so you can make sure you are comfortable. It also has a three-hour auto turn off switch. This is a safety mechanism so it will turn itself off if you happen to fall asleep with the blanket over you. And while many electric blankets have to be carefully hand cleaned if anything is spilled on them, this one is a piece of cake. 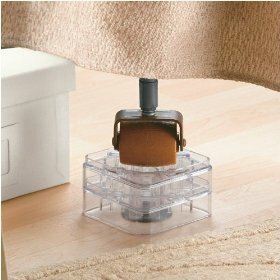 It has been constructed so you can take the throw part off and it can be tossed into the washing machine and cleaned. That a portion of the sale goes to charity to support breast cancer awareness and research. The three settings let you fine-tune the heat so you are comfortable instead of turning it on and off all of the time. The auto shut off safety setting gives you a little piece of mind. Made to fit all standard sized cribs and toddler beds, the set has everything you need to get you started. The design features a moon and stars which is sewn on to the pieces, it is not printed on. The set is machine washable making it easy for you to keep clean. The set comes complete in zippered carry bag with a handle. All these pieces coordinate nicely together giving the nursery an all over look. Maybe its time your bedroom got a make over and you have decided to settle on an up market range of bedding. Well if you are looking for luxurious bedding, then you will love the look and feel of Giotto Bed Linen by Sferra . This luminous bed linen is crafted in Italy from s590 thread count, 100% Italian Egyptian Cotton sateen sheeting. 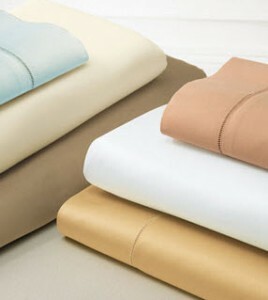 The bedlinen has a border of hemstitching and the duvet cover has hemstitching on three sides and has a button closure. There is a matching gathered bed skirt which has a plain hem. The Giotto bed linen range includes duvet covers, shams, sheeting, and bed skirts. And it is available in Twin, Queen and King and Cal. King bed sizes. Believe me, nobody ever regretted buying luxury and quality and that’s what you get when you buy Giotto bed linens from Sferra. Truly beautiful bedding that will enhance the decor of your bedroom. Just imagine coming home to this gorgeous bedroom setting each night. The crisp looking, soft feeling effects of the ANALI Blossom bed linen set will have you wanting to retire early every night. 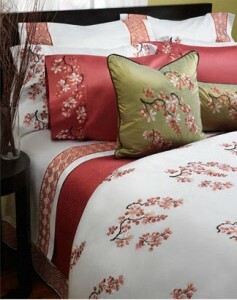 Beautifully embroidered in the US using only the finest rayon thread to give the bedding its exquisite color and detail. The bedding pattern consists of fronds of colorful cherry blossom flowers which have been intricately embroidered on white background of 300 thread count, 100% Egyptian cotton sateen sheeting. ANALI create truly beautiful bed linens that will give your bedroom a modern and elegant look. The ANALI range of bedroom linen designs are truly inspired embroidered works of art. The set is available in both Queen and King sizes. And there are a variety of coordinating pillow shams available. The dark olive green with khaki backing of the Nautica Seagrove Olive Comforter is a blend of colors that is well suited to a masculine bedroom or to compliment a nautical themed room. This comforter is even well suited for a younger boy’s room. The comforter is designed to match other Nautica Seagrove items such as the pillow sham, bed skirt and sheets giving the room a coordinated look. Made from one hundred percent cotton makes it easy to launder as it is machine washable. 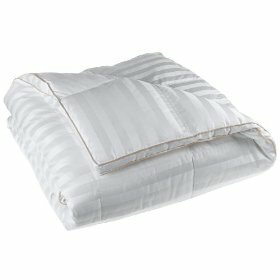 Nautica has an excellent reputation for their bedding products and the Nautica Seagrove Olive Comforter is an excellent buy. The comforter is available in twin, full/queen and king sizes. Those who reviewed the comforter said they were completely satisfied with the color, quality and the style. Straight across the board, the Nautica Seagrove Olive Comforter has five star ratings. CLICK HERE to buy the Nautica Seagrove Comforter. If you are looking for warmth during the cooler months you may want to consider the Royal Velvet Majestic Gold 1200-Thread-Count Hungarian White Goose Down Comforter . Almost everyone who have purchased this comforter mentioned just how warm and comfortable it is. Quite a few mentioned that they are cutting energy costs by being able to simply turn down the thermostat at night and sleep comfortably under what they consider to be a hotel quality comforter. A few of the same reviewers even say they can open a window in the middle of winter, and don’t fight with bedmates over the covers anymore. Most think that the baffle box construction does a good job keeping the feathers evenly distributed although some found that their comforter continually lost its feathers and did not hold its shape. Even those who were unhappy with the loss of feathers decided to deal with the loss of down as the comforter is so warm and soft. Several reviewers with past experience of feather down comforters said they automatically went ahead and put a duvet cover over the top of it to keep it cleaner anyway, so that the shedding issue wouldn’t come up at all. They also experienced no shifting of the feathers in the baffle boxes. The warranty on the comforter is only honored if it is kept in a duvet, as one reviewer pointed out, so using one is a good idea. Overall, the four star rating this comforter gets seems deserved. All those who use it with the recommended duvet cover have nothing but good things to say, and the complaints about down escaping or feathers shifting to the edges are no more than for other comparable products. CLICK HERE to buy the Royal Velvet Majestic Gold 1200 Thread Count Hungarian White Goose Down Comforter.